This blog is written by Judy Liddell, a passionate birder from Albuquerque, New Mexico. I became interested in birds in 2002 when a friend placed a seed bell and suet cake in the tree outside of my bedroom window as I was recuperating from having both knees replaced. At first I just enjoyed the noisy chatter. Pretty soon I became interested in figuring out who these new friends were. The day I spotted a Curved-bill Thrasher hanging on the suet feeder, I was excited. A couple of months later, a Northern Flicker perched on my neighbor’s roof. When I looked at him through my binoculars and saw the beautiful coloring, I was thoroughly hooked. I bird almost every week with the Thursday Birders, have kept data for Cornell University’s citizen science Feederwatch Program, am an avid eBirder, do wetlands surveys for the Rio Grande Nature Center, monitor Cooper’s Hawk’s nests with the Albuquerque Cooper’s Hawk Project, am involved with Save the Belen Marsh, serve on the board of Central New Mexico Audubon, am President of the New Mexico Audubon Council, and bird whenever I travel. 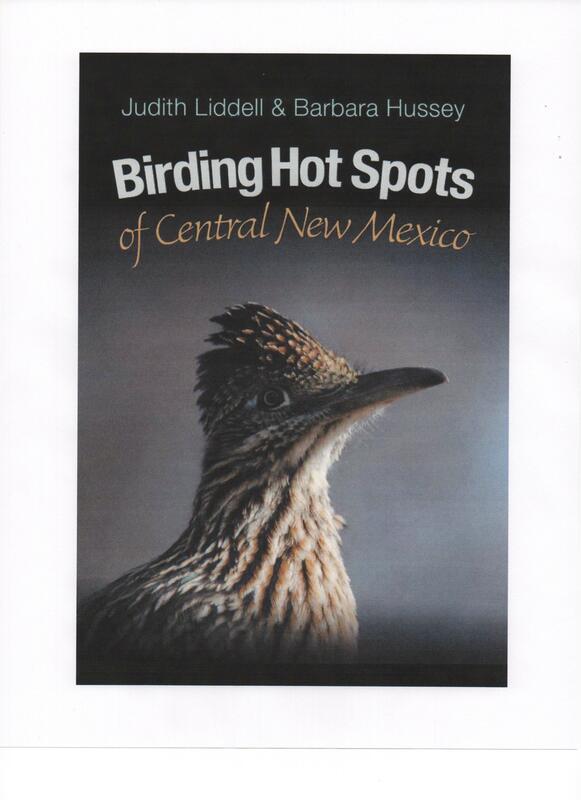 Check out Birding Hot Spots of Central New Mexico, the book I co-authored with Barbara Hussey. I have birded with the Thursday birders twice. My daughter lives in ABQ and I hooked up with Rebecca and you kind folks a couple of years ago. Your work is a source of admiration to me as my blog did not last this long, although I have hopes of re-erecting it. I chanced upon your wonderful blog while searching for birding areas around Socorro. And I am glad I did. I enjoyed reading your passionate and well written posts. I was at Bosque Del Apache last November to photograph Sandhill Cranes and Snow Geese. It was one of the greatest birding experience for me. I am visiting Bosque this year during Christmas week but I wanted to go around to see other birding areas. I am also visiting White Sands during this trip. Will you be able to guide me to the possible birding opportunities in and around Socorro in December? I would recommend driving out to the Very Large Array. It is about 50 mi. west of Socorro on US 60. The area in which it is located is called the Plains of San Augustin, comprised of dry saltbush flats where you should be able to find Sage Sparrows. It is also a good place to find wintering raptors. At the campground in Water Canyon (16 mi. west from Socorro on US 60)you have a good chance of seeing Acorn Woodpeckers and Red Crossbills. Thank you. It would be interesting to get to see the Acorn Woodpecker. Hi, I just came across your blog via the Nature Blog Network. What attracted me to your blog was your description about birding in New Mexico. I have lived in northern California (Santa Clara County) for 34 years, but my husband and I had an opportunity to live in ABQ for about 3 years (1996-1998) and I fell in love with the state. We have visited the Bosque del Apache Crane Festival every year since 2003 and always enjoy ourselves when visiting. We will be visiting again this year. Will you be attending? I am going to add you to my RSS feeder since your blog is so enjoyable to read regarding birds and birding in a place I enjoy reading about (New Mexico). I’m going to be visiting Albuquerque at the end of next week. I’m really interested in seeing black-chinned sparrows and gray vireos. Can you recommend any places near ABQ to see either or both of these species? Hello, great postings! I am going to be birding this Sunday in the Western Sandia open spaces. Am I likely to see black-chinned and black-throated sparrows? Any local birders that would enjoy going with me? I am of intermediate experience and would love to go on the Thursday trips if I didn’t work on Thursdays. Therefore, Sunday is my only good day to bird. I am “cc” at Duke City Fix and came to here from there. What a wonderful blog you have here. I have bookmarked it and will come back! For me lately I too have enjoyed Curved Bill Thrasher – who comes to my yard a lot these days in the far north valley of Albuquerque. I love reading your blog. Also adore that you track birds in our urban areas! We’ll link to you on our blogroll. Judy – I’m coming to Albuquerque this month to get a camera cleaned and search for the 3 toed woodpecker. When I spoke with you while you were in silver city, you suggested that I check with you. Let me know if you’ve seen one lately. My email is dennisricdlane@gmail.com. I have been reading your blog for several years now. Since I live in Ontario, Canada, it is a bit of vicarious birding and I have been thinking about coming to New Mexico to bird for quite some time. Now that the ABA is sponsoring a birding rally in your area, I signed up. So in less than a month I will be arriving in Albuquerque to do some ACTUAL birding. Can’t wait!!!! Love your blog. Glad you are able to visit central New Mexico. Hope you buy a copy of “Birding Hot Spots Central New Mexico” (birdinghotspotscentralnm.com) before your trip. Enjoyed your class on Spring Birds today! And thank you for the info on Alaska birding. Your Hot Spots book has been a favorite and very useful. Thanks, Maggie. Did you find my blog posts about Alaska in the category directory on the right? I visited different areas, but it would give you an idea of some of the possibilities – especially the Seward area. are you 100% sure this is a guira tanager? maybe a female cherries tanager? I have a picture of the same bird but am not sure what to name it. Sophie, I presume you are inquiring about my photo from Ecuador. The bird was identified by our guide. Is it possible to help me identify a Bird here in Albuquerque? This one I’m just not 100 percent on! Any help will be greatly Appreciated!